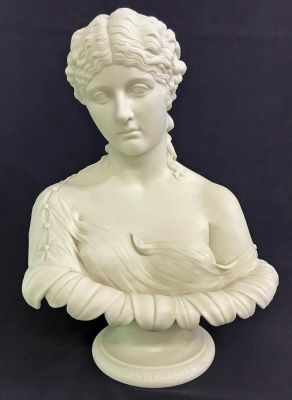 A Copeland attributed Parian bust of the goddess Clytie from Greek mythology. Modelled by C. Delpech in 1855, after the antique, to be given as awards for the Art Union of London. The plinth is impressed “Art Union of London 1855” in the front and “C.Delpech (Regt)” at the back. There are minor chips to the plinth. 9” by 6”, 13” high. The bust was modelled after the Roman marble bust (circa 40-50 AD) in the possession of Charles Townley. Townley acquired the sculpture during a Grand Tour of Italy, 1771-1774.